The Sangiran Early Man Site is one of the key sites for the study of human evolution. A second occurence of "Java Man" was discovered here: first discovered in 1891 at Trinil by Dutchman Dubois, more skulls were found by an archeological party organized by German G.H.R. von Königswald at Sangiran (near Solo). 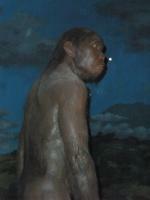 "Java Man" at the time was one of the first known human ancestors. He is now been reclassified as part of the species Homo erectus. About 60 more fossils have since been found here, making it the most fruitful of the early hominid sites that have been named a WHS. The skull and bone pieces have been discovered by both archeologists and locals in quite a large area. This whole area (56 square km) has been designated a WHS. The entrance gate, car park and souvenir stalls are worthy of a monument à la the Taj Mahal. Sangiran clearly is proud of its WHS status. I arrived by taxi from Solo train station (18km). The station has 5 trains a day to Yogyakarta, so it's a good day trip from there. The Sangiran site consists of a museum, a huge building with a creative layout. However, there are only two exhibition rooms containing skulls, bones and tools. Sangiran's story is that of 'Java Man", discovered in the fields here in the 1930s. 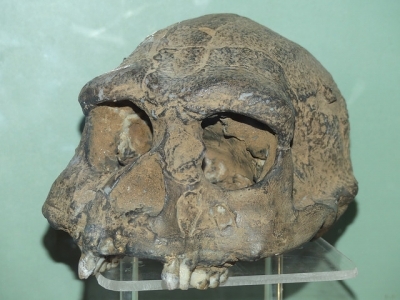 It is part of the species Homo erectus, one in the chain of predecessors to the modern homo sapiens. At about 700,000 - 1,600,000 years old it is the oldest finding in Asia, but a lot younger than the African examples of early hominids. The site is also known for its animal fossils and neolithic stone tools. I've seen a number of Early Hominid WHS now, and they all struggle to turn their historical fame into a good visiting experience. Sangiran unfortunately is no exception to this. I guess it's best to tick it off quickly, and spend the remaining part of the day in nearby Solo. This is a relaxed Javan town with two Royal Palaces and a couple of nice little restaurants. I visited this WHS in August 2018 in the late afternoon after a pleasant day in Prambanan. Although the museum structure and area is quite big, its condition is not up to standard and the actual space dedicated to Sangiran No. 17 and other Java Man finds is only restricted to two rooms with a couple of stands and display cases. The smaller museums close to the excavation fields are even worse and such an apparently important WHS for Homo Erectus studies is not given the prominence it might deserve, in favour of national pride and school group outings. Out of all the prehistoric man sites I visited (haven't visited the one in Beijing yet but not too eager to either), this was definitely the worst and apart from the WHS tick for WH travellers, I wouldn't sacrifice anything from the 2 top-notch WHS of Borobodur and Prambanan to visit. Apart from the few animal fossils and ancestor bones on display out of the thousands kept locked in a storage room, the most interesting features of the museum were the informative video of the locals who found some of the fossils and bones (with subtitles in English) and of course the display case with Sangiran No. 17's skull (photo). Possibly because I was primed for an underwhelming experience for my first 'early hominid' fossil site WHS, I actually quite enjoyed my daytrip from Yogyakarta to Sangiran. The museum exhibits were pretty decent, but without a background in geology or the other scientific fields involved, a lot of the summations of facts and figures and dates didn't really stick. While English versions of the exhibits were clearly abridged summaries of the Indonesian language versions, they were generally present and basically useful. My visit became interesting, beyond simply the halls of the main museum, when I realised that I hadn't properly clarified what the specific boundaries of the WHS were before setting off in the morning. As I didn't have access to phone internet that day, I had a minor panic that the museum was only in a buffer zone and that I needed to find an actual dig site. Luckily, I thought, a man approached me upon leaving the museum to take me to 'the site'. I saw nearby a large billboard advertising the recent opening of four new museums in the Sangiran area, so I assumed he meant one of these, as surely they were constructed over the dig sites. So I got on his bike, and he took me down a random dirt path until we got off, and he directed me to start walking into a field. 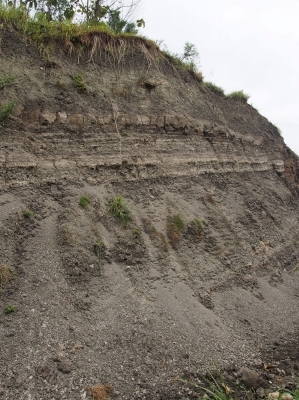 Soon, he pointed at some dirt and stated that he, personally, found homo erectus there in the early 1990s. I cannot verify this claim at all, and honestly I am a bit sceptical, but who knows. When we got back, I was still worried that I hadn't actually 'ticked off' the site yet with this random field, so I got him to take me to two of the newly opened museums. This was not worth the time and money. One of them, Manyarejo, was a small room with similar artefacts to the main museum but without any English explanation, and the other, Bukuran, was a large complex clearly designed for schoolchildren. All the exhibits are colourful, cartoonish, and in Indonesian. Multiple school groups thought it was hilarious that a random foreigner was there, and in May I was among the first foreigner (and only non-research student) in the mandatory guest sign-in book for the year. Without Indonesian-language skills, therefore, there is no reason to go to any of the smaller museums in the Sangiran area. I can't really review this site as I went on a Monday. FYI: The site is closed Mondays as are many other museums in Indonesia. If you plan to visit do it on another day. Bribing the guards didn't work either (to walk the outdoor area). I also recommend to combine this (not UNESCO) with a visit to : Ceto and Sukuh Temples. You won't be able to visit on a day trip by train; you need a (private) car then. Read more from Chris W. here. The Sangiran Early Man Site may not be as popular a destination as its neighboring W.H.Sites Prambanan and Borobudur. Nevertheless, to be fair, it is a well-maintained museum of great importance worthy of a visit. From Solo, my friends drove me to the site on a motorbike. Despite summer heat, the 45 minute journey over the countryside is pleasant, providing a good survey of beautiful traditional Central Javanese houses. 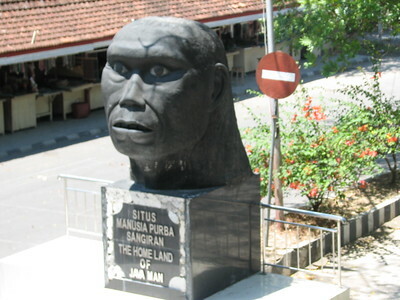 Upon approaching Sangiran, one can notice the plethora of billboards and signage promoting the "Homeland of the Java Man". Such local efforts are truly commendable. The site is divided into areas: the museum and the view-deck on top of a nearby hill. I managed to see both, but the latter was a bit disappointing as it fails to pinpoint the perimeter of the site - aside from endless trees, you can actually see the dome of the museum and that's just it. The three exhibition halls are presented in a way that would make visitors really get hooked on what is being highlighted by Sangiran. I enjoyed the bones a lot (in the second hall, you are even allowed to touch the fossils of an old mastodon)! The main problem, however, is that most descriptions and verbiages are only in Bahasa Indonesia, which was a bit sad on my part as I really read stuff. For a site/tourist destination of worldwide importance, I think it is imperative to provide English texts/translations for other nationalities to understand what those stored inside the museum are. I'm not quite sure if the management has plans to open some of the dig sites for ocular visits, but it should be one feature worth considering for Sangiran (In fact, Lenggong Valley, another WHS in Malaysia, is looking at highlighting their in situ sites for tourism as well). Also, to my surprise, the present museum building is actually designed by the grandfather of a friend of mine in Jogjakarta - which is, of course, another reason to celebrate the visit. Finally we arrived at Sangiran Museum. It's such great place for us to introduce this Early Man Site to our kids. It was rain so we decided not to visit the digging site but we were so happy the guide showed us the video of how the bones can be found after burried for million years. So interesting. The Museum were built in modern architecture and still in progress of renovation. I would recommend Sangiran Museum as one of study tour or field trip object for students in Indonesia. If I didnt insist to see the sites, the visitors could only see the museum which consist of only several bones and replica which is not very well maintained. I'm very sad to see how this appointed WHS could be treated like it's taken for granted! 54 Community Members have visited.